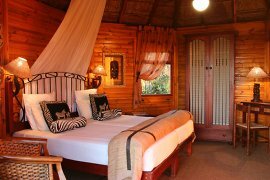 Garden Route Game Lodge, offering Big 5 South African Safari experience, is situated in the heartland of the world famous Fynbos Botanical Route, offers you the Big Five in a malaria free environment. Conveniently located off the N2 between Albertinia and Mossel Bay. Only 3½ scenic hours drive from Cape Town, one hour from Swellendam and 30 minutes from Mossel Bay on the Garden Route. * Children of all ages are welcome at the Garden Route Game Lodge and are specially catered for. * Children are accommodated in our Luxury Lodge Family Rooms only. 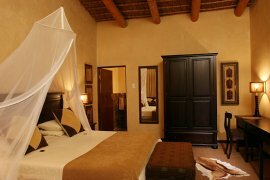 * Children between 6 and 12 years pay half price for accommodation packages, meals & game drives. * Children under 3 are free. * Children are accommodated in two separate beds.